Description: Perennial herb with stolons to 50 cm long, rooting at nodes; flowering stems 5–45 cm high, with lateral bands of long (1–2 mm) fine simple spreading or recurved hairs and scattered hairs elsewhere. 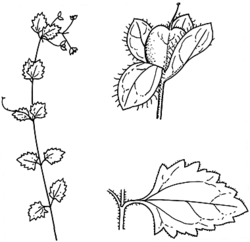 Leaves with lamina ovate or broad-ovate, 0.7–3 cm long, 5–20 mm wide, apex rounded or broad-acute, base truncate to slightly cordate, margins with 3–13 pairs of coarse and irregular obtuse teeth; petiole 2–20 mm long. Racemes lateral, 1.5–8 cm long, to 10-flowered or occasionally flowers solitary, racemes 1.5–8 cm long; peduncle 0–25 mm long; bracts 3–9 mm long; pedicels 3–30 mm long. Calyx lobes 6.5–8.5 mm long, 2.5–5 mm wide in fruit, ciliate. Corolla 4–6 mm long, pale blue or lilac. Capsule broad-obovate, 2.6–5.8 mm long, 2–5.5 mm wide, emarginate, margin with dense fine erect hairs especially towards apex. Distribution and occurrence: Grows in a range of habitats, especially eucalypt forests; widespread.